I wanted to get some numbers out there as a follow-up to my 1 in 4 post. I realized that one in four doesn’t really mean much when you don’t know how large the one in four population comes out of. The report, from the National Alliance to End Homelessness, “Vital Mission: Ending Homelessness Among Veterans”, tells us that almost 200,000 of the homeless population are veterans. When looked at from the context of the almost 210 million people that veterans can come from, (United States men and women aged 18 and over), it is only 10 percent of the population, and doesn’t seem to be that alarming. But when taken into the context of the homeless population, which is estimated to be 744,000, having 195,827 of your population coming from one very specific sector of the parent population is as astounding as it is alarming. This is disgusting. It is granted that the cost of care for an active member of the military will be higher. But having fully one quarter of the homeless population being none other than the men and women who fought and lost for our country is appalling. This section of the homeless population should never have been and should never be homeless in the first place. There is no reason for it. We can end this epidemic in this country. So why don’t we do it? Do not let the numbers numb you to the fact that we are rapidly approaching one million human beings homeless in the United States. In a country with an expendable income in the billions, there is no reason for any of this to be happening. Our veterans. My grandfather, for one. 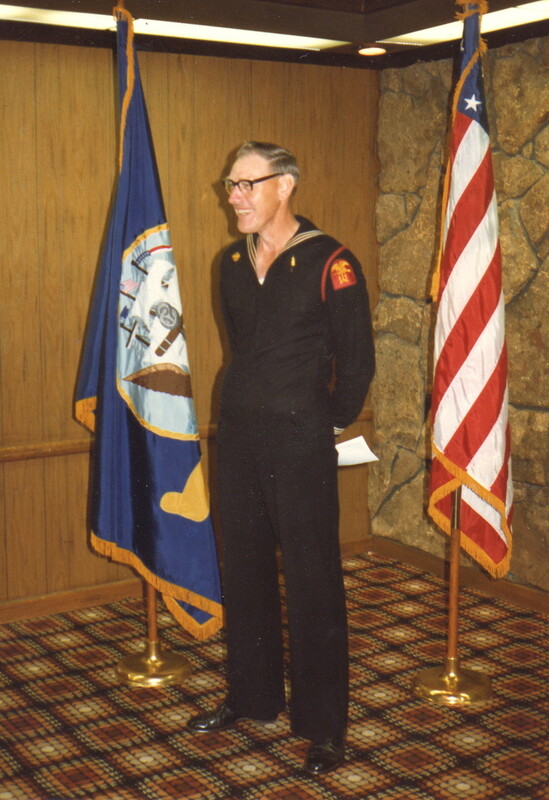 This is him in his Navy blues at his 1982 reunion. When he returned from World War II, the G.I. Bill gave him plenty of opportunities, but from what I could tell he never needed to take advantage of them. He was one of the fortunate ones. Many of his fellow brothers and sisters of the Navy succumbed to the mental ravages of the horrors of war. My grandfather never talked about his time in the pacific theater. This tradition continued through every war since then. The stresses placed on the mind during times of war is insurmountable by many of the men and women who volunteer to protect this country. We pump billions into the maintenance of the war effort, we pump billions into the recruitment and training of troops, but when it comes to what happens afterwards we largely turn a blind eye to their suffering. The Associated Press sent out a story today highlighting the startling realization that 1 in 4 of the homeless population is a veteran. This disgusts me in ways that I have been having a hard time quantifying since I read the piece. This country, this self-righteous, hypocritical, fear-mongering, war profiteering, god blessed country, has hit an all time low for me. We run around demonizing those people brave enough to speak out about the war, (not the men and women fighting it), but turn up our noses in disgust when one of those people from the armed forces pleads for help. 1 in 4 homeless in this country is a war veteran. Not some poor schmuck who washed out of boot camp and is feeling sorry for themselves, but an honest to god war veteran. That guy you saw dragging the plastic bag full of aluminum cans, dirty from head to toe, who hasn’t seen a shave in what seems like 20 years, and has a look of dementia in his eyes, could very well be the guy who ran out of the foxhole and saved your father. Or he could be the one who took an extra minute searching the field and found the land-mine that would have surely taken out your mother. The guy that watched your brother’s back while searching and clearing buildings in Iraq? That could have been him. Do you remember the story your sister told you about the crazy marine who drove the Humvee through a hail of bullets, bombs, and blood to get her out of the crossfire she would have died in? That guy you just venomously told to get a job was him. We have one day, Veterans Day, set aside to honor and remember those who fought and died for the freedoms we take for granted. It is observed on the 11th of every November. Yet this day is so much an afterthought that we do not treat it nearly as well as the more commercial holidays like Thanksgiving and Christmas. God forbid we ever take a day off to spend with the people that fought to protect our nation. Next time you step over, around, on, or cross the street to avoid a member of the homeless population, stop and wonder whether they might be that one in four.